October is the best time of year to invite your friends and family to southern and eastern Kentucky. The colorful canopy stretching from ridge to ridge creates a beautiful display as you travel through the mountains. I invite you to log onto TOUR Southern and Eastern Kentucky's website www.tourseky.com to find tours and upcoming fall festivals as you plan your weekend activities this month. One of my favorite festivals in our region is Morgan County's Sorghum Festival in West Liberty. I joined Judge Executive Tim Conley, Mayor Jim Rupe and the Morgan County Chamber of Commerce at the festival last Friday to celebrate the daily tornado recovery progress, as well as the anticipation for a major reconstruction annoncement in the coming weeks. Stay tuned to my social media for the details. During the Chamber meeting before the festival, I introduced my newest field representative, Grayson Smith. Grayson is a life-long resident of Salyersville, Kentucky and is now the new contact for all of the counties in the Big Sandy Area Development District and the FIVCO Area Development District Counties in the 5th Congressional District. I have the utmost confidence that Grayson will represent eastern Kentucky with the highest diligence and dedication. 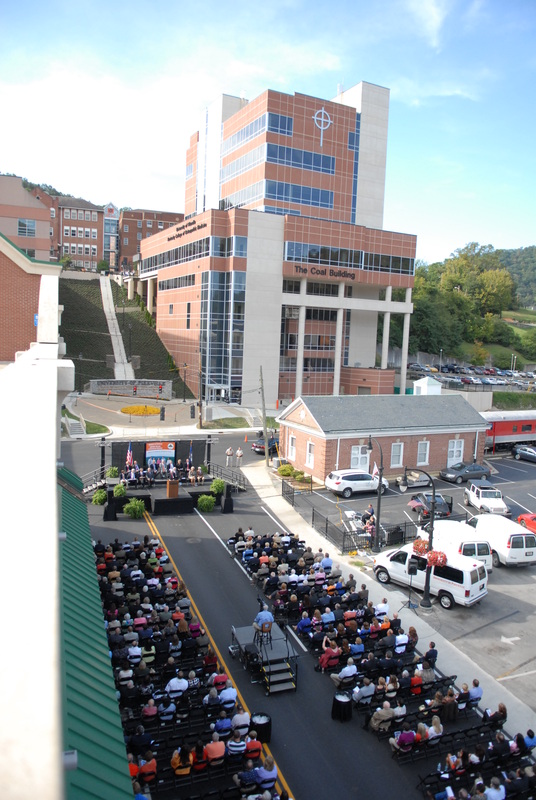 On September 15th, I had the honor of joining the dedication of UPIKE's new "Coal Building" for the Kentucky College of Osteopathic Medicine (KYCOM). The medical school has already earned national awards and recognition and I commend UPIKE President Paul Patton for his continued efforts to promote the best education in our region. In September, my colleagues and I took an important step forward in stopping the war on coal. Coal is not America’s energy problem, it is America’s energy solution- which is why this costly attack on Kentucky coal miners and American businesses has got to stop. On September 21, 2012, the U.S. House of Representatives passed, and I voted in support of, the Stop the War on Coal Act. This legislation will prevent Washington bureaucrats from issuing regulations that kill jobs and further set back our slow economic recovery. It is time the President realize that his policies are wrong-headed not only for coal, but for our country. To see me speak on the U.S. House of Representatives floor taking a stand for our coal miners and coal communities click here. While making important strides in ending the war on coal this month, we also made significant progress in combating the prescription drug epidemic. On September 20, 2012, I was joined by the Pew Health Group in Washington, DC for a Capitol Hill briefing focused on the role of Prescription Drug Monitoring Programs (PDMP) in combating the illegal trafficking and abuse of prescription painkillers. The Pew Health Group shared study results of the effectiveness of state PDMP’s and put forward a set of best practices that all U.S. states and territories can use to improve their effectiveness. I am hopeful that the results shared at this briefing will encourage every state and community to make prescription drug monitoring programs a priority and help us to work towards ending prescription drug abuse once and for all. If you would like to receive more frequent updates on what’s happening in Washington, please send me an email, join my Facebook page, follow me on Twitter, or subscribe to my YouTube channel. Thank you to everyone who has dropped by to share your opinion -- let’s keep the dialogue going! U.S. House of Reps passes "Stop the War on Coal Act of 2012"
With over 2,000 coal layoffs this year in Kentucky alone, and the EPA’s halt on mining permits, do you believe the President supports an all-of-the-above energy plan? Do you think the record high gas prices for the month of August are a result of the President's failed energy policies? WYMT-TV: U.S. House of Reps Passes "Stop the War on Coal Act of 2012"
WYMT-TV: University building dedicated as "Coal Building"